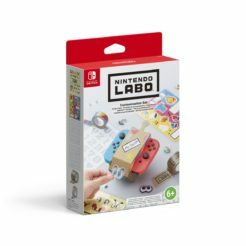 Customise your Toy-Con creations with the Nintendo LABO Customisation Kit. Apply colours and stickers, modify the shape or create custom parts. Experience an enhanced comfort and feel of the Xbox wireless controller. Compatible with both your Xbox One Console and Windows 10 PC. Use the Samsung Gear VR controller as a remote to navigate your virtual reality with ease or use it as a gamepad complete with trigger to win battles. Explore a new chapter in Marvel’s Spider-Man PS4 universe as a more experienced Peter Parker. Bundled with the latest PS4 Pro console. Nintendo Switch is a breakthrough home video game console. It not only connects to your TV, but it also instantly transforms into an on-the-go handheld.